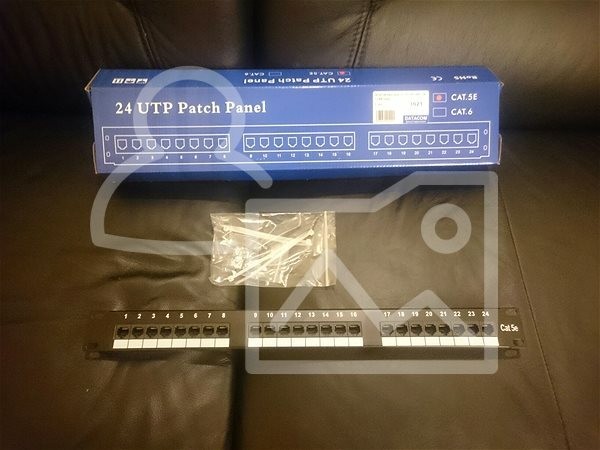 This built-in patch panel has 24 RJ-45 ports for large-scale networking. The panel is suited for a rack and has a black finish and supports category 5e cabling. For shipping to other EU countries visit this page Datacom, 24x RJ45, straight, CAT5E, UTP, black, 1U. Für Versand nach Deutschland, besuchen Sie bitte Datacom, 24x RJ45 gerade, CAT5 UTP, schwarz, 1HE. Chcete doručit zboží do Česka? Prohlédněte si Datacom 24x RJ45, přímý, CAT5E, UTP, černý, 1U. Chcete doručiť tovar na Slovensko? Prezrite si Datacom, 24× RJ45, priamy, CAT5E, UTP, čierny, 1U. Für Versand nach Österreich, besuchen Sie bitte Datacom, 24x RJ45 gerade, CAT5 UTP, schwarz, 1HE. Magyarországra történő kiszállításért tekintse meg ezt a termékoldalt: Datacom, 24x RJ45, közvetlen, CAT5E, UTP, fekete, 1U.